Meeting Minutes for the February 15th, 2007 local reunion group, by Glenn Kurosaki. The group was treated to a tour of the rooms where our reunion will be held. We were shown the Terrance Rooms adjacent to the pool and the Studio rooms. Both rooms were very nice. Reunion Committee, Inc., (the “Company”)the company we hired to plan our reunion had sent copies of the proposed invitation, informational sheet, payment tear sheet and class questionnaire for review. After reviewing the proposed documents, the invitation was approved, the informational sheet was approved subject to changing the font style to allow for easier reading, and the tear sheet was approved. The group rejected the proposed questionnaire and approved the use of the questionnaire prepared by the questionnaire committee headed by Nancy Sellers. Glenn informed the group that the Company, had sent a first mailer to the addresses we provided to see how much of the list was still usable. The Company provided the local group with the results of their mailer and asked that the local group check for typos and for any addresses anyone knew was incorrect. It was agreed that a copy of the mailing list be distributed to the reunion group for review and to check for typos and known wrong addresses. Comments and revisions to the mailing list will be due by the next local committee meeting. Glenn informed the group that the Company is now working on finding those people the first mailer did not hit. The committee also discussed where to hold the after reunion gathering, traditionally held the morning after the reunion. The group inspected the Terrace Restaurant directly adjacent to the Terrace Room within the Sheraton Universal Hotel and locations up the hill with Univeral Studio’s City Walk. After learning that none of the restaurants within City Walk were large enough to house our group, the Group decided to investigate the Terrace Restaurant in greater detail. Randy Farber volunteered to check out the resturant’s Sunday Brunch and provide the group with his report. 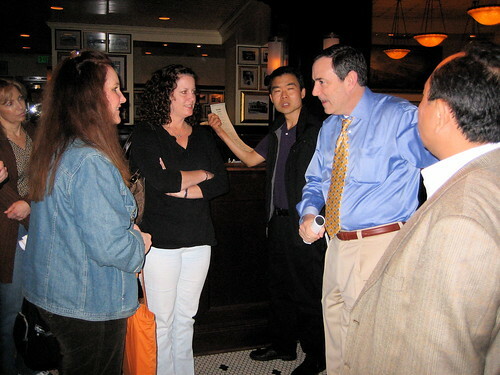 Several group members commented upon the convenience of having the after party there. A decision would be made at the next meeting of the local group. The meeting adjourned with agreement that the next meeting take place within three weeks. After looking at the calendar, Glenn unilaterally decided to select March 7, 2007 at 7:00 p.m. for the next meeting. The location for the meeting will be announced later but will be held within Encino, Tarzana, or Reseda. Stay tuned for more info. Our locally based reunion committee met last night at Universal City. Special Awards, Questionnaires, Memorabilia. We also took a tour of the ball rooms. So far, we have contact info for about 100 classmates. our committee e-mail address, reseda1977@yahoo.com. Daniel Shudo, Randy Farber, John Tsuchiyama. Location(s): Sheraton Universal, Daily Grill at the City Walk, Universal Studios. Our next meeting is scheduled for March 7, 7pm, location TBD.